Whether you've decided on a Douglas fir or a more artificial model this December, your tree will look a little more interesting with one of these ornaments. 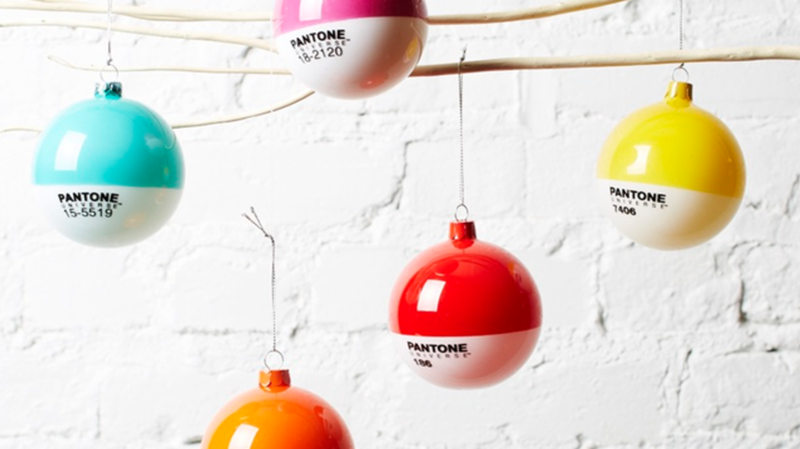 Color enthusiasts will love decorating with these Pantone ornaments. The two-toned glass baubles feature bright tones and their corresponding Pantone color numbers. Give the gift of grump: This plush Grumpy Cat ornament looks like a cartoon version of the beloved Internet cat. The glass ornament is just under 5 inches tall and is sure to impress your Whovian friends. According to novelty goods seller Archie McPhee, Germans used to hide pickles on their trees for children to find. While this isn't true, the ornament still exists. If putting a pickle on your tree wasn’t weird enough, this one also yodels. When switched on, a motion sensor will alert the ornament of visitors and it will sing its little pickled heart out. Many know Pusheen as the adorable feline web comic character who makes appearances in gifs and Facebook stickers. Now, the lovable cat can make an appearance on your tree in the form of a plush ornament. Hang around the common cold, a brain cell, the kissing disease, and E. coli with these plush, microbe-themed ornaments. Make your tree worth texting about with these plush Emoji ornaments. The ornaments come in sets of two with options like heart eyes, sunglasses, and tears of joy. He may not have appeared in the original comics, but Walking Dead character Daryl can still show up on your tree. For some holiday suspense, hang a walker ornament nearby. What could be better than a bacon ornament? How about one that sparkles? The glitzy ornament is made out of plastic so you don’t have to worry about it breaking when someone inevitably tries to eat it. This ornament is a smaller version of the Major Award featured in the holiday classic, A Christmas Story. The ornament comes with a wooden lampshade and black fringe. Sure, plenty of naked squirrels roam freely outside your home, but if a squirrel wants to hang around inside, it’s going to need to put on some underwear. Season's greeting from the Mesozoic Era: This T.rex ornament, made of resin and glass, is available in sets of one or three. Only one can sit on the iron throne, but many can own it, thanks to this miniature version. The officially licensed product is perfect for anyone itching for the next season of Game of Thrones. Perfect for jokesters: a festively dressed rubber chicken. While this vinyl chicken doesn’t make any noise, it’s a fun addition to the Christmas tree. This is the most festive droid you’ll see this season. The resin R2D2 ornament sports antlers and Christmas lights. These bottled fairies will look great on any gamer’s tree this year. The tiny fairies are available in blue, green, purple, pink, orange, or yellow. Fans of the classic comedy, National Lampoon’s Christmas Vacation, will remember the scene when Clark Griswold receives a wrapped cat from Aunt Bethany. The ornament even meows to help recreate some of that movie magic. This glowing jellyfish ornament ensures that even when the string lights are turned off, your tree will still shine. Most people love pizza, so it stands to reason that most people will love this glass ornament. Tacos deserve just as much space on the Christmas tree as a slice of pizza. This blown glass ornament is hand painted and perfect for the taco aficionado in your life. Unfortunately this handmade record player ornament, featuring the Beatles, can't play music, but it will look very charming on your tree. With this Xenomorph ornament, you’ll be sure to have the scariest tree in the neighborhood. This woolly crusader, made with wool, pipe cleaners, and felt, is here to protect your tree from bad guys. For gamers with a wide breadth, get them this set of eight controller-themed ornaments. The slick designs feature controllers from consoles like the Wii, Playstation, and XBox. You probably haven’t seen a lot of your friends since Fallout 4 came out. When they finally emerge for Christmas, honor their return with one of these Fault Boy ornaments. You can pick between Strength, Endurance, Perception, and Santa Hat. The officially licensed resin ornaments are currently on pre-sale. Get one of the latest Star Wars villains in ornament form. The hand-painted resin figurine comes with a translucent lightsaber and will look great looming in the darkest section of the tree. Is the Gremlins movie a holiday movie? Unclear. Regardless, this Gizmo ornament will look festive on your tree. Just don’t get him wet. Budding geologists and watercolor painters alike will enjoy these beautiful ornaments. The set of four comes with stylistic depictions of an emerald, black dodecahedron, pink ruby, and teal topaz. Each one is handmade and decorated with "underglazes, inlay, shiny clear glaze, and gold dimensional glass paint." For the oddball in your life: Santa Claus riding a shark. They'll likely appreciate the thought that the fishes in the ocean need presents too! Do you know a dad who spends a lot of time on the couch? Give the Homer Simpson in your life this set of ornaments dedicated to what he loves best: TV and potato chips. The set of six comes with a TV remote, a chair, a bag of chips, and three abstract baubles.